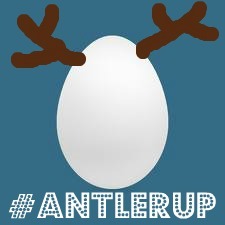 I've been racking my brain this past week trying to figure out a way to participate in Taming Insanity's #AntlerUp link up. You see, I have no antlers. But I could really use that Starbucks gift card because having a newborn means I pretty much need caffeine running through my veins 24/7. Fortunately in life, sometimes material has a way of presenting itself. If you are out of the loop you can catch up HERE. But basically @TamingInsanity and I were accused of being spam when I accidentally tweeted the wrong person about #MugSwap2011. I've been called a lot of things in my day, but spam? This is a first. I promise not to harass you about iPhones or Viagra so please don't report me!